We have selected the following articles published in 2014. 1) Our first study evaluates the performance of dispersionless and dispersion-accounting methods. More, specifically, as a prototypical dispersion-dominated physisorption problem, we analyze here the performance of dispersionless and dispersion-accounting methodologies on the helium interaction with cluster models of the TiO2(110) surface. 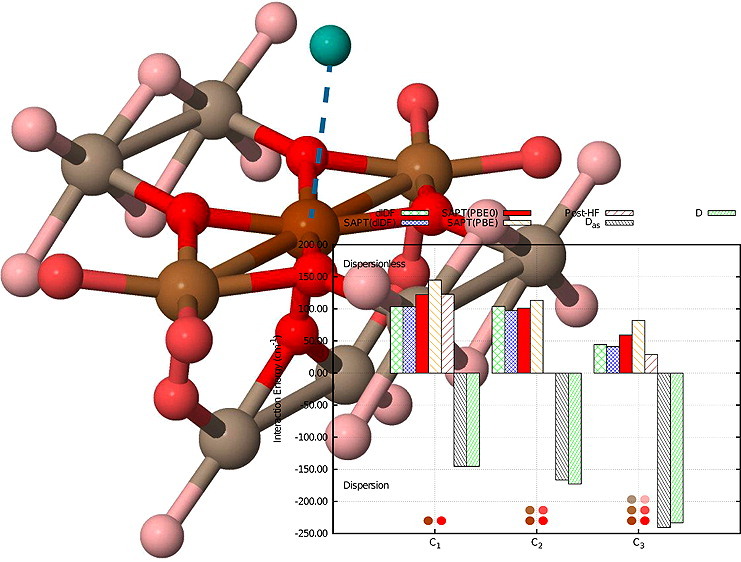 A special focus has been given to the dispersionless density functional dlDF and the dlDF+Das construction for the total interaction energy (K. Pernal, R. Podeswa, K. Patkowski, and K. Szalewicz, Phys. Rev. Lett. 2009, 109, 263201), where Das is an effective interatomic pairwise functional form for the dispersion. Likewise, the performance of symmetry-adapted perturbation theory (SAPT) method is evaluated, where the interacting monomers are described by density functional theory (DFT) with the dlDF, PBE, and PBE0 functionals. Our benchmarks include CCSD(T)-F12b calculations and comparative analysis on the nuclear bound states supported by the He–cluster potentials. Moreover, intra- and intermonomer correlation contributions to the physisorption interaction are analyzed through the method of increments (H. Stoll, J. Chem. Phys. 1992, 97, 8449) at the CCSD(T) level of theory. This method is further applied in conjunction with a partitioning of the Hartree–Fock interaction energy to estimate individual interaction energy components, comparing them with those obtained using the different SAPT(DFT) approaches. The cluster size evolution of dispersionless and dispersion-accounting energy components is then discussed, revealing the reduced role of the dispersionless interaction and intramonomer correlation when the extended nature of the surface is better accounted for. On the contrary, both post-Hartree–Fock and SAPT(DFT) results clearly demonstrate the high-transferability character of the effective pairwise dispersion interaction whatever the cluster model is. Our contribution also illustrates how the method of increments can be used as a valuable tool not only to achieve the accuracy of CCSD(T) calculations using large cluster models but also to evaluate the performance of SAPT(DFT) methods for the physically well-defined contributions to the total interaction energy. Overall, our work indicates the excellent performance of a dlDF+Das approach in which the parameters are optimized using the smallest cluster model of the target surface to treat van der Waals adsorbate–surface interactions. 2) Our second selected study proposes a general strategy to calculate accurate He–surface interaction potentials. It extends the dispersionless density functional approach recently developed by Pernal et al. [Phys. Rev. Lett. 103, 263201 (2009)] to adsorbate-surface interactions by including periodic boundary conditions. We also introduce a scheme to parametrize the dispersion interaction by calculating two- and three-body dispersion terms at coupled cluster singles and doubles and perturbative triples (CCSD(T)) level via the method of increments [H. Stoll, J. Chem. Phys. 97, 8449 (1992)]. The performance of the composite approach is tested on 4He/graphene by determining the energies of the low-lying selective adsorption states, finding an excellent agreement with the best available theoretical data. Second, the capability of the approach to describe dispersionless correlation effects realistically is used to extract dispersion effects in time-dependent density functional simulations on the collision of 4He droplets with a single graphene sheet. It is found that dispersion effects play a key role in the fast spreading of the 4He nanodroplet (see figure below), the evaporation-like process of helium atoms, and the formation of solid-like helium structures. These characteristics are expected to be quite general and highly relevant to explain experimental measurements with the newly developed helium droplet mediated deposition technique. This study involved an extensive european network.